In Feburary, I attended a lecture “Naturescaping: Gardening for the Birds and their Friends”, sponsored by the The Saint Louis Urban Farm & Sustainable Development Group. The speaker was Mitch Leachman, Executive Director of the St. Louis Audubon Society and coordinator of their Bring Conservation Home program. I’ve been gardening partly to benefit birds for over 10 years now. I’m not allowed to have bird feeders where I live, but I can provide a water feature and plants that help provide food, shelter and nest materials. I also have permission from the Condo Association for a nest box, which was used by Carolina Wrens this past summer. I refrain from using pesticides to help ensure that the bugs in my garden are safe for birds to eat. Like a lot of people, I am also interested in invertebrate conservation, so I have planted several species of plants specifically to be used as host plants for butterflies and as habitat for beneficial insects. One of the factors that helps birds to successfully raise young is the ability to find food. 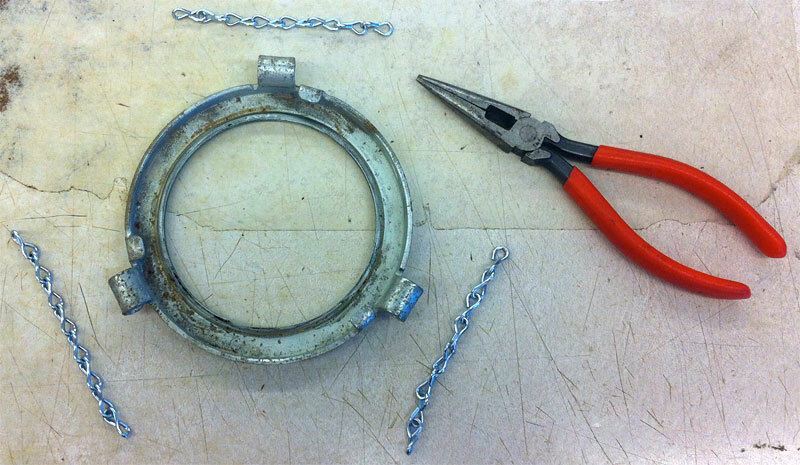 Seeds and nectar feeders are great for feeding adult birds, but most wild baby birds need lots of animal protein. One amazing statistic that Mr. Leachman shared with us is that it takes the equivalent of 6-9,000 caterpillars to raise one brood of chickadees! That’s a staggering amount of invertebrates. Hummingbirds don’t feed nectar to their young – they feed tiny caterpillars, wasps, bees, gnats and spiders. Clearly one of the best ways to help birds is to learn more about how to co-exist with invertebrates. Some of them don’t need to be controlled and of those that do, there are ways to manage them that minimize harm to other species. Most of us have been raised to think of all invertebrates as something that must be eliminated from our environment, but if you think of them as bird food, some of them might be acceptable in your yard or garden. “Bird-friendly means insect-friendly”, stated Mr. Leachman. Caterpillars are often tolerated by people better than other insects because they grow into beautiful butterflies and moths. They can be very attractive in their own right. 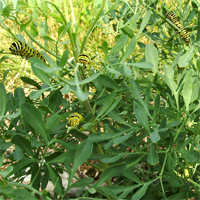 Caterpillars are also excellent bird nutrition – they are soft and have a very high protein content. You can grow caterpillars in your garden with non-native plants as I do with Queen Anne’s lace and Rue, but you’ll get more caterpillars if you plant native plants. Fall is a great time to plant trees, shrubs and perennial plants – if you choose native plants that are used as host plants by moths and butterflies, you will help feed a lot of birds. 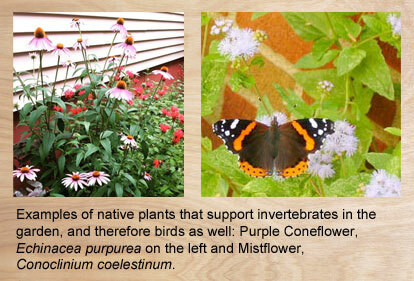 Native plants have had more time to evolve with our native butterflies and moths. Therefore, as Mr. Leachman pointed out, native plants can be utilized as host plants by many, many more species of butterflies and moths. To name a couple of extreme examples, Oaks are used by 518 species and Hostas are used by none (yes slugs eat them but no larvae of butterflies or moths use them as a host plant). Large trees, understory trees, shrubs, herbaceous plants and ground covers can all be good host plants, and native plants are available in all of those categories for all growing conditions. Native plants are available at some nurseries – don’t try to take them from the wild because many native plants are endangered along with native birds. 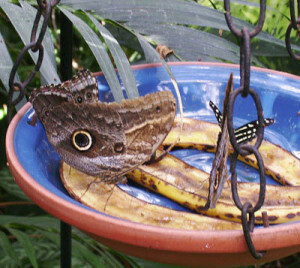 Do less tidying up in the garden – removing plant debris destroys many cocoons and overwintering creatures. If you can’t let leaves, dead plants and other natural materials alone in your whole garden without getting grief from your Homeowners Association or neighbors, try experimenting with an out-of-the-way section to conserve some of the insects. Plant fruiting plants that bear at varying times of the year. Plant a good variety of species – if plant diversity is low, insect diversity is low. Plant large bunches of host plants so they are easier to find rather than scattered individual specimens. Care for the total ecology of your garden or yard – the whole food web will be healthier and more productive. Many common birds in Missouri are in decline – several have lost 60-70% of their numbers in the last 40 years. 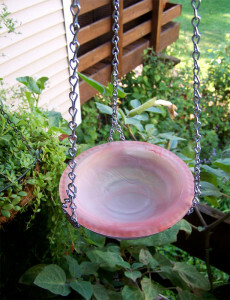 Feeding and watching birds is the second most popular hobby in the USA after gardening. To make sure there is always a variety of birds to watch, you can make your part of the environment healthier for birds! And you can further help your local bird families with items we have at Schnarr’s, such as feeders, seed, suet, nest boxes and bird bath heaters! The next step in finishing my kitchen backsplash is to complete the tile work in four frames spaced at intervals above the strip. These are inspired by Spanish and Mexican tile murals in their shape and placement though they don’t attempt to depict any kind of representational scene. 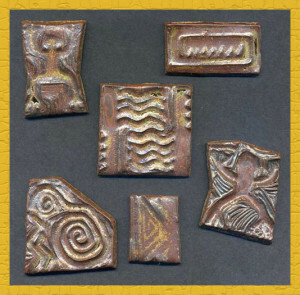 In the interim I had carved some new rubber stamps of ancient petroglyph designs and made some small stoneware tiles from them which I decided to include. Using paper templates, I laid out my designs on trays in the studio, then transported them to the kitchen. As you can see in this picture, since I last worked on the tile strip, I installed a narrow shelf above the back of the stove. This is made from a piece of recycled flooring. I painted it in a color harmonious with my intended future paint scheme and sanded the edges for a slightly distressed look. I used corner brackets to mount it to the wall, attached with screws so I can remove it when it’s time to paint the wall. It is meant for holding some of the small Southwestern-themed collectibles that I keep in the kitchen. Later on I’m going to install another shelf above this frame with hooks on the underside for displaying a favorite set of collectible coffee cups. Here is the frame partially filled with tile. Using a pencil and ruler, I marked where the large tile in the middle would go then worked out from the middle and the edges. I dabbed a bit of tile cement on the back of each piece and pressed it in place. Normally with tile work a quantity of cement is spread out on the surface first before the tiles are placed, but my way of working is slow so I wanted to make sure the cement didn’t dry before I could finish an area. After the tiles are allowed a sufficient time to dry according to the directions on the tile cement bucket, the next step is to grout the tiles! After absorbing inspiration and stockpiling tiles for my kitchen for three years, how did I begin the process of actually getting some tiles on the wall? I’ve been intending since I moved in to my condo in 2004 to eventually repaint the kitchen. The paint in this room is rough, and even worse, it’s pink! So it has to go and until it’s repainted it doesn’t matter to me if I mark it up with pencil or tape. To begin my designs I cleared everything off of the counter top and used a ruler and pencil to mark where I wanted strips of tile. This work would be too much to be completed in one work session. It being necessary to use the kitchen in between work sessions, I had to devise a way to design and install the strips in sections. I decided on a repeating pattern that would appear at intervals, with more free-form arrangements in between. I measured where the repeating elements would go and decided how many I would need, then I went into my studio and designed one of the repeating sections. Then I made sure I had enough of those tiles to repeat the pattern the required number of times. 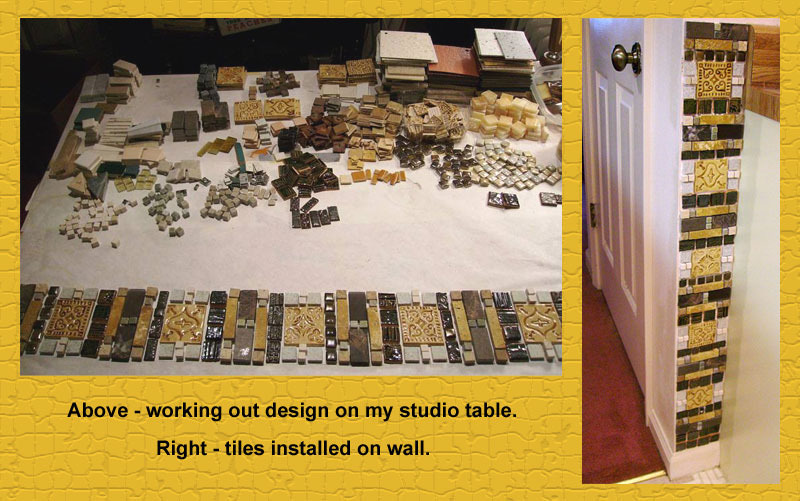 Choosing the tiles from which to create the repeating patterns could have been an overwhelming task, given the number of tiles I had accumulated – I had been collecting them for multiple projects, not just the back splash. For help I referred to the swatch page I had made for my kitchen to help me keep in mind what look and feel I wanted for the room. I hung up the swatch page nearby and sorted out tiles that seemed to fit. That narrowed down the selection and from those I was able to come up with the repeating pattern. I laid each section out on a tray in my studio and carried it into the kitchen to install each section, then repeated until all the recurring sections were in place. After that was done, I filled in the spaces between the repeating segments, then added a strip in a terra cotta color above it. A strip similar to this would be very easy to do with purchased or made to order tiles of a uniform size. 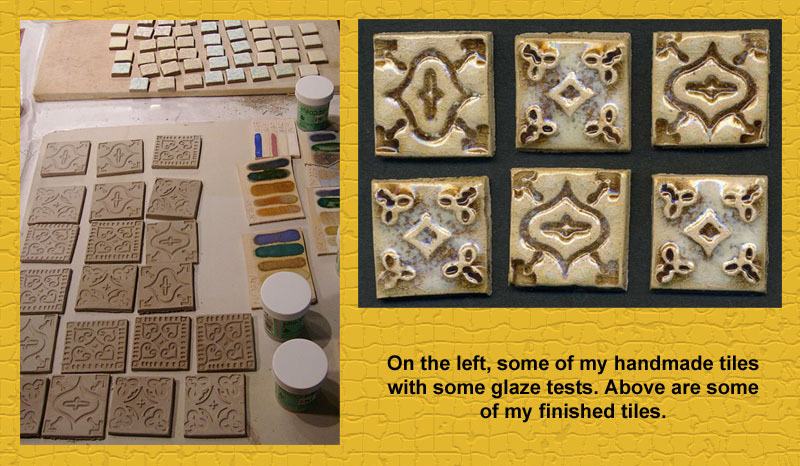 Since I was including a lot of salvaged tiles however, I had to do a lot of piecing, cutting and nipping. I’m very pleased with the result and I think it was worth the extra effort – it would not be to everyone’s taste but is exactly the kind of look I wanted. 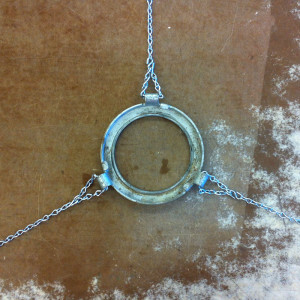 There is no way anyone would be able to replicate this design exactly even if they wanted to! While I had the tiles out, I decided to do a strip by the pantry as well. I drew an outline of the area to be tiled on the paper that covers my studio table, then filled that in while working out my design. 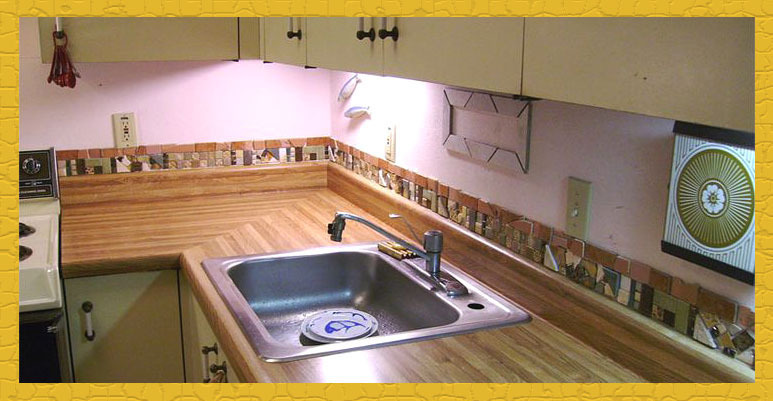 When I was satisfied, I placed some of the tiles on a tray, carried it to the kitchen, and installed the tiles one section at a time. I marked the wall with pencil lines before beginning so that I didn’t go out of the allotted spaces while installing. While working on the tiles, I gave some thought to the future paint scheme of my kitchen and picked out color swatches. I put the swatches and some notes in my idea book and also marked in pencil what color goes where on the kitchen walls. When I wrote in my previous article Decor Idea Book that my home decor would take years to complete, I was not exaggerating. I’ve been interested in tiles and mosaics since I was a teenager, but the real impetus for beginning to decorate my condominium home with tile was a visit in 2009 to Henry Chapman Mercer’s Fonthill Castle in Pennsylvania. Among other things, Mercer was a tilemaker in the Arts and Crafts era and his historic home is decorated with outstanding examples of the tilemaker’s art, both from his own designs and tiles he collected on his travels. What brought me to the vicinity of Fonthill was a buisness trip to Philadelphia. I arranged with my employer to arrive a day early so I could visit Fonthill Castle. The morning after my visit, I sketched tile design ideas in the hotel restaurant while waiting to meet my boss for breakfast. Later on I gave some thought to how I would turn these designs into tiles. 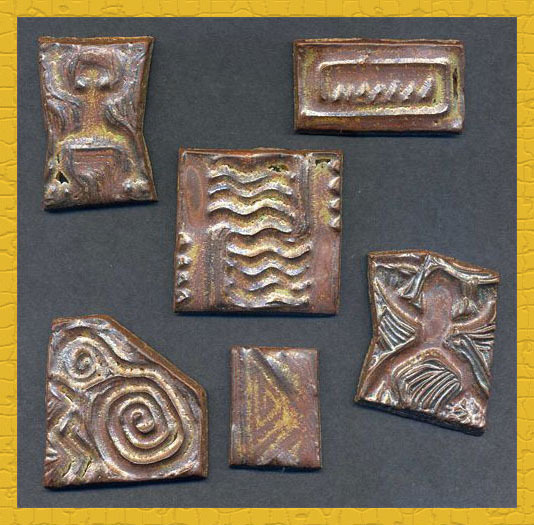 Mercer favored plaster press molds, but since I had a small company on the side for which I designed rubber stamps, I decided to turn my designs into stamps and use them to impress the clay tiles. See my tutorial Mosaic Table Table Top With Textured Clay Tiles to learn my technique for making tiles from rubber stamps. In 2015 while on the way back from a trip to the Northeast I was in the vicinity of Fonthill again, so I stopped in the tileworks shop to buy some tiles made from Mercer’s original molds. One of my favorite places to vacation is the Southwest, and for awhile I was taking so many trips to that area on Route 66 that I was in Santa Fe for at least a day or two almost every summer. Although I’ve been interested in art and crafts ever since I can remember, my first visit to Santa Fe while on a family vacation at the age of 16 was a life-changing experience. It was so different, so exotic and so saturated with the arts that I decided then and there that art was to be my area of study in college and I did eventually graduate with a Fine Art degree. Over the years I’ve been to Santa Fe enough times to have a favorite restaurant – Cafe Pasqual’s – and a favorite motel – El Rey Inn. In September of 2009 I was on a trip with my family on the way to Arizona and we stayed at El Rey. It was Mom’s first time there and she was enthralled with the grounds. Since tile work and plans for my own home were on my mind, we wandered the exquisite grounds together and took lots of photos, with tiles prominent in my photos for future inspiration. On this trip my brother and I also introduced my parents to our favorite suite at El Rancho Hotel in Gallup, NM, the Ronald Reagan suite, with extensive tile work in the bathroom. Everyone should experience these historic properties at least once in a lifetime – you won’t be sorry! Since Southwest decor and good food seem to go together, I decided the proper place in my home for Santa Fe inspired tile work is in my kitchen. Over the next 2-3 years I made a lot of tiles for this project. I’ve been augmenting my growing store of tiles with recycled tiles that I picked up at Leftover’s Etc., a teacher’s resource recycling center where you can get donated leftover art and craft supplies for a very reasonable price. Since the stock varies depending on what is donated, collecting tiles suitable for a specific project can take quite a while, so it suited me to acquire these periodically while I slowly accumulated a stock of handmade tiles. You might ask, why not just buy the tiles you need and get it over with? There are beautiful tiles available commercially – one could make a lovely kitchen with these. However, while I’m sure I could design a very nice backsplash out of commercial tiles, my preference for my own home is to express my love of ceramics by putting more of myself into the project. Another thing that makes this project more personal and special is that in addition to my collection of salvaged tiles purchased from Leftover’s Etc., over the years I had accumulated tiles from sources significant to me – I added in some that I recycled from an old farmhouse down the street from where I grew up that was demolished when I was in college, and some that I dug up from the construction debris-filled soil while working on my current garden. 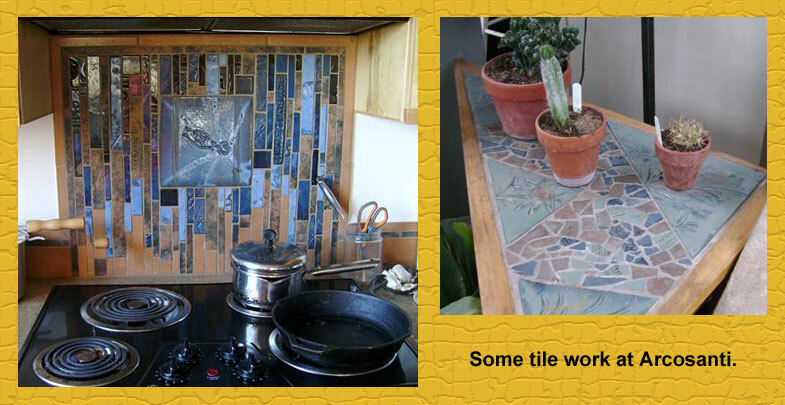 Whenever I work in my kitchen I’ll get pleasure from thinking about how I made or acquired the tiles in front of me. 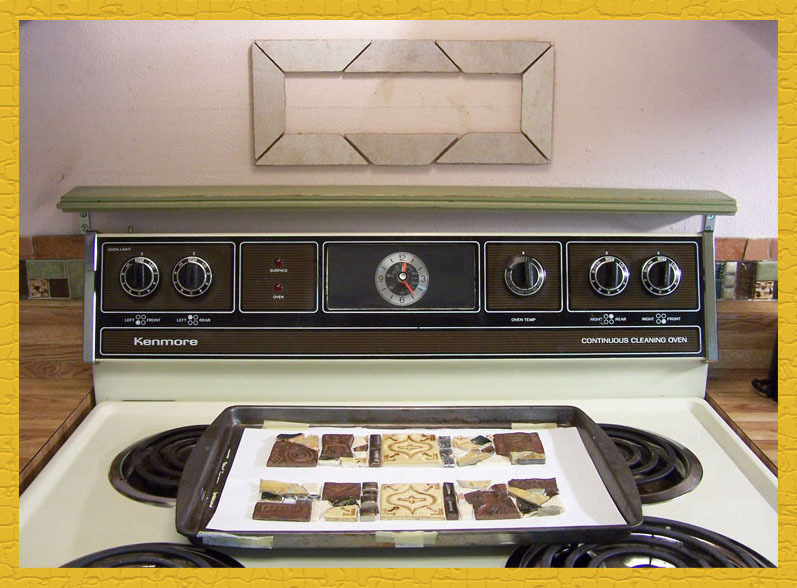 The next major step forward in my kitchen backsplash project occurred in the fall of 2012. I had just returned from a vacation/sabbatical which included a one-week workshop at Arcosanti, an experimental community in Arizona that teaches concepts in architecture, sustainability, re-use of materials and many other topics of interest to me. 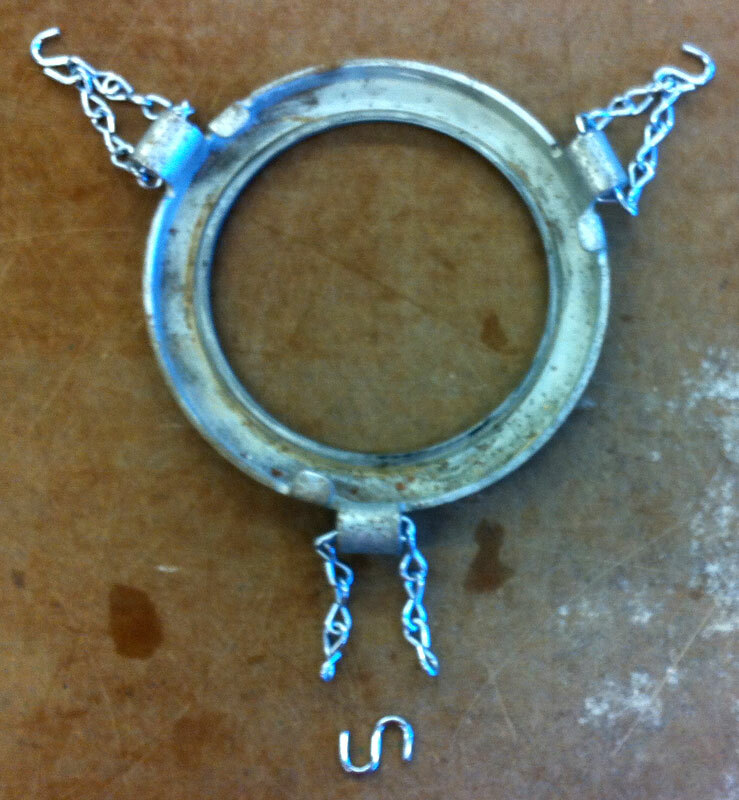 Visitors to Missouri Botanical Garden will have seen some bronze bells made at Arcosanti. There is a ceramics studio on the site and many areas of the community are decorated with wonderful tile work. I went to Arcosanti to be inspired, and wow was I ever! Upon my return I was fired up to work on the backsplash due to what I had seen and I was satisfied that I finally had enough tiles to begin. Look for Part II of this series to see how I incorporated all these creative influences! When the leafblowers remove the leaves, they also knock over my plants, blow away plant tags, blow away fertilizer, blow my mulch into the lawn and blow seeds out into the lawn which makes the lawn weedy and my plants less likely to reseed themselves. Trimming the plants in the fall destroys hibernating beneficial insects and removes winter food and cover for birds from the garden. The resulting bare soil is more likely to erode and I lose plants over the winter due to the soil drying out and freezing more deeply than it would with a natural cover. I have to water more often to compensate for the lost moisture and that costs the condo complex money. My gardening space is all part shade and shade plants are adapted to living under tree litter for the most part rather than bare soil so it’s difficult to get things to grow. The groundskeepers don’t necessarily know which plants I want and which ones I don’t and they often spray the wrong ones with herbicide. I can’t label them because the leaf blowers blow the markers away. Even if they always sprayed the right ones, I don’t want poison around my home. I’d rather pull the weeds and compost them or smother them with lasagna gardening. So how do I propose to handle garden cleanup this fall? One of the first gardening books I bought after moving into my condo was “Making the Most of Shade” by Larry Hodgson since I was new to shade gardening at the time. I haven’t reviewed it for awhile so I got it out to see if it had anything helpful about managing leaves. The kind of fall cleanup I’d like to do is none at all. Will that work? I know the groundskeepers will need to remove leaves from the lawn, because the lawn will die if they are not removed or chopped up on the spot. My garden will be a nuisance if leaves blow off of it onto the lawn and I don’t want to cause problems. 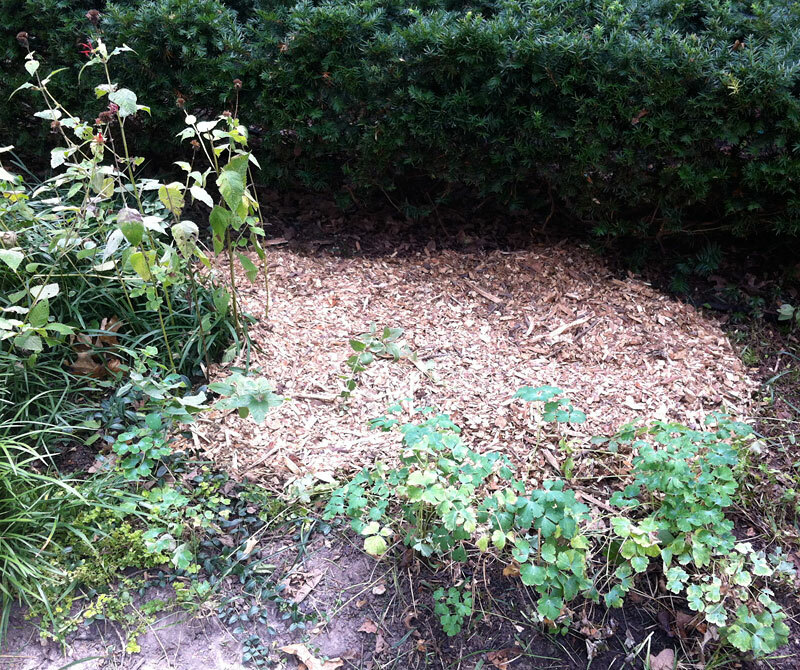 I plan to toss some wood chip mulch over the leaves periodically to keep the leaves in place. If the resulting leaf/mulch piles threaten to exceed 8 inches in depth (if you go over that you may harm tree roots) then I plan to remove some of the leaves and either chop them and return them to the garden or use them in one of the other two gardens I help manage. My perennial plants if left alone should do some of the work of holding leaves in place also. The trees around my condo are almost all oaks and I’ve read that oak leaves may form a mat which keeps water from getting through to the ground and they are also slow to break down. Nitrogen helps dead leaves break down faster, so whenever I apply wood chip mulch I will also add some high-nitrogen organic fertilizer. Help hold leaves in place. Pierce leaves with their roots so that water can get through. Feed small birds with their seed heads. Decompose after they die and eventually feed my other plants. The oats die off in winter so they should not become weedy. Schnarr’s can special order some oats for you so you can try this in your own garden if you’re interested in cover crops. Stay tuned for a report on the results of my experiments! What is Lasagna gardening? No, it’s not growing delicious tomatoes and herbs that you can put in your lasagna, though you may eventually be able to do just that depending on your conditions. Lasagna gardening, also known as sheet composting, is an organic gardening method that entails covering the ground with layers of materials of organic origin and allowing them to naturally break down over time. The benefits of this method are less time and labor spent weeding and tilling, creating healthy soil for healthier plants, and reaping the many benefits of compostable materials instead of wasting them. If you are thinking of starting a new garden bed next spring, fall is a good time to begin it and lasagna gardening is a good method to use if your chosen ground is covered with vegetation that you want to kill off. 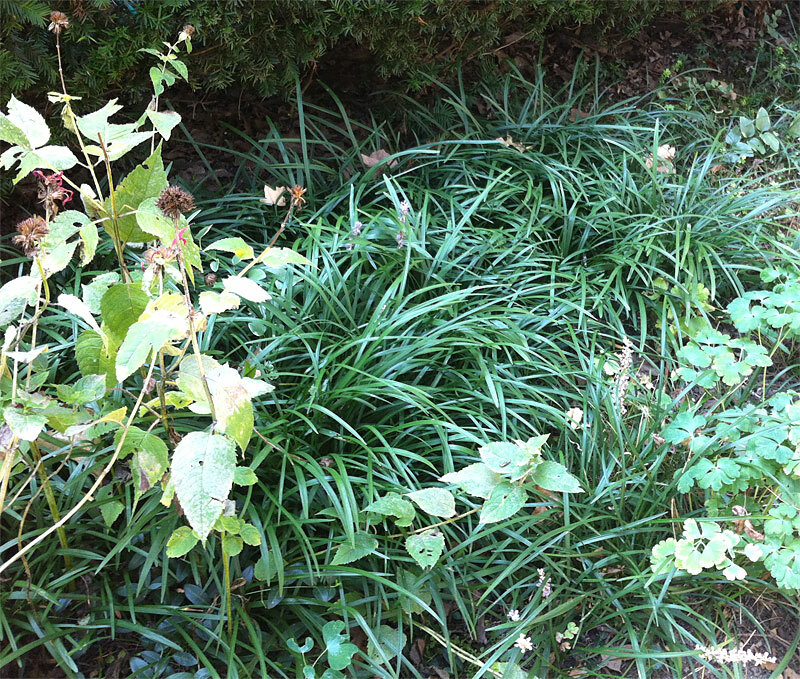 I’m demonstrating with a section of a shade garden that is covered with liriope. I like it but I have too much of it so I want to get a section ready to put in something new later. If you’ve ever tried to dig up lirope you can imagine how much time I will save by just smothering it! This method works for grassy areas also or any piece of ground covered with unwanted vegetation. Here is what my section of garden looked like before I started. Ironically, the Liriope that I want to smother with lasagna gardening is the best looking plant in this section right now. The Bee Balm on the left and the Columbine on the right are not at their best in late summer. Next spring they will be gorgeous! First gather up all the compostable materials that you can. The first layer consists of cardboard, paper, newspapers and other recyclable paper based products. I have been saving for a couple of months so there is more than enough for this section. Mark off the space that will become your garden. You can transplant the vegetation already on the spot if you need it elsewhere. 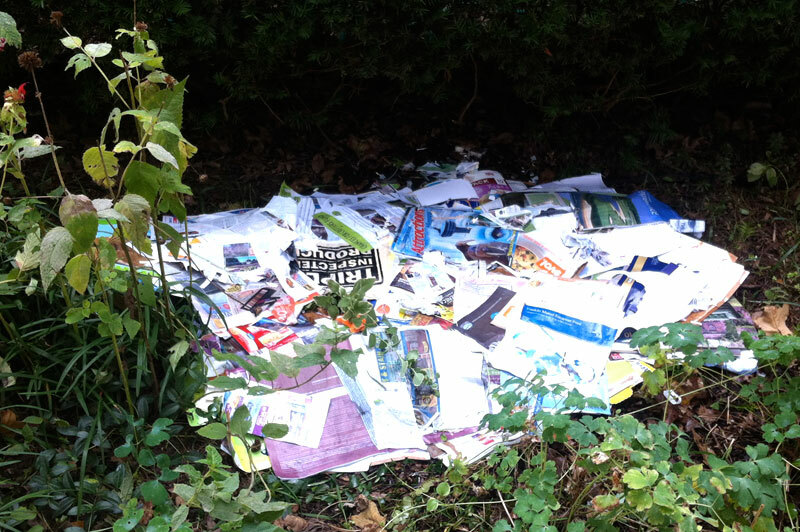 If it’s ok to kill it, just cover the area with several layers of cardboard and paper without leaving gaps in between. 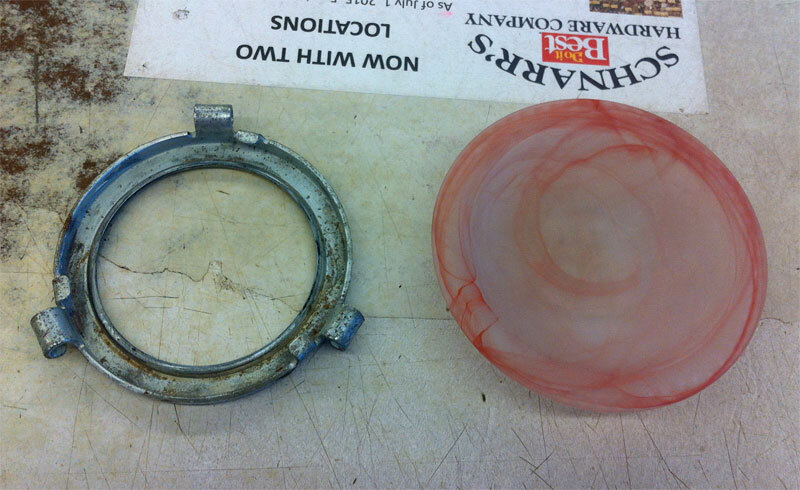 If it’s windy, wet the paper as you go – I dunked mine in a bin of water before applying. The paper will block the light and kill the vegetation underneath which will decompose and eventually become plant food. Lasagna gardening helped me get some good use out of junk mail, product packaging, and other unwanted paper products. This is about five grocery bags full. Wet the layer after you’re done applying it if it’s not already wet. This helps jump start the decomposition process. Build subsequent layers by alternating green and brown compostable materials. Examples of brown materials are dried leaves, shredded paper, and dried dead plant materials. Green materials are grass clippings and fruit and vegetable scraps from your kitchen. Layering the green in between the brown helps to break the pile down faster, but it will eventually break down even if you have a small amount of green materials in comparison to brown. Add in whatever else you would normally put in the compost – eggshells, coffee grounds, and the like. In my case since I live in a condo community where people walk their dogs nearby, I didn’t want interesting odors to attract them to my garden so I left out the kitchen scraps and used only paper and cardboard. If you want to do some fall planting, you can put soil and fertilizer on top of your compostables and plant now. If you are planting on top of tree roots, don’t make your layer more than 8 inches thick as anything deeper may kill tree roots, according to the book “Making the Most of Shade” by Larry Hodgson. If there are no tree roots to damage, you can make the lasagna 12 inches thick. I don’t know what I’m going to plant yet or whether I’m going to plant in spring or fall, so I topped off mine with wood chip mulch. Wood chip mulch protects the lasagna gardening area until I’m ready to plant. When I’m ready to plant I plan to just add soil on top of the mulch, because my lasagna is nowhere near 8 inches thick yet and it won’t hurt to make the new bed deeper. I’ll add nitrogen-rich organic fertilizer at the time to accelerate the breakdown of the wood chips. In a previous article I described stenciling with paint on a wood garden sign. That works great if you don’t want a lot of small words but I found myself in need of some new garden signs that would require a lot of text on them. I decided to find a way to computer generate the text and put it on a weatherproof sign. In the past I had purchased produce from a co-op and had saved a couple of the thin wood crates thinking they would be useful for garden markers of some kind. I decided to make small signs from this wood and print out my text on clear acetate and attach that to the signs with brads. I have some special gardening challenges where I live. I want to have a Permaculture garden. Different people will define Permaculture slightly different ways but the easiest way I can explain it is that I want to manage my garden in a way that works with nature instead of fighting it in order to save both labor and money. Surrounding my condo are large Oak trees which deposit mass quantities of leaves each season. The types of plants that thrive under trees are adapted to grow in the conditions created by a yearly deposit of leaf litter which is not removed but left to decay in place. However since I live in a condo, the leaves are removed by the groundskeepers which causes a lot of problems. I have mostly perennial plants which are not intended to be replaced each year. The leaf blowers make the plants look bent and bedraggled, as if they’d just been power-washed. The plants need the winter protection provided by leaves, so I have more die-off than I should. Leaf litter helps soil retain moisture and most shade-adapted plants like moist soil. When the naturally provided soil protection is stripped off, the soil dries out too much. I can see why a plant seller would be happy about this, but I’m a plant consumer and I’d rather keep the ones I have rather than keep buying new ones! To keep plants alive I have to water more which costs the condo complex money. I can and do put down mulch, but the leaf blowers blow a lot of it into the lawn which doesn’t help either my garden or the lawn to look it’s best. I think my garden would look a lot better and be healthier and require less maintenance if the groundskeepers would leave it alone. I have explained the situation to the condo management and they have agreed to let me deal with the leaves myself this season and keep the leaf blowers away as an experiment. Getting the agreement is one major step forward, getting the groundskeepers to comply will be another challenge. I don’t expect the groundskeepers to remember which is my garden, there are around 1,500 units where I live. 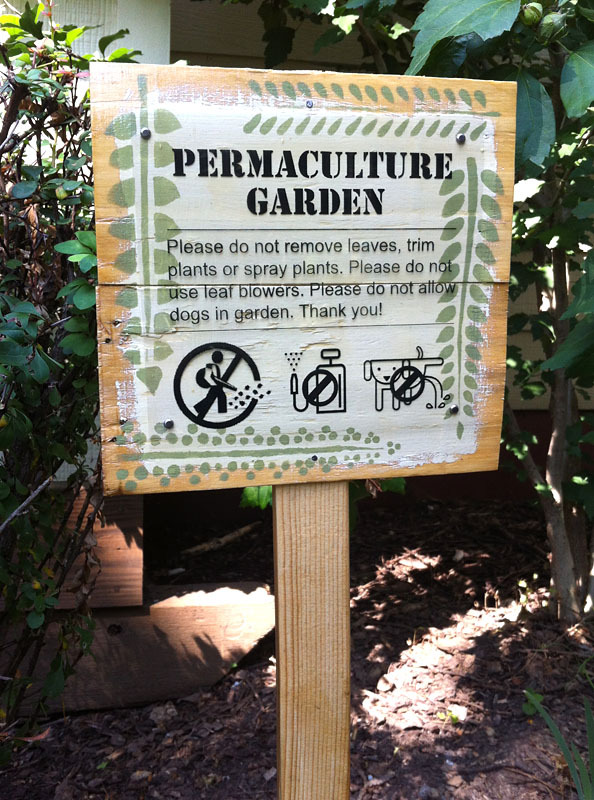 So I obtained permission to install six signs to place around my garden which would read: “PERMACULTURE GARDEN. Please do not remove leaves, trim plants, or spray plants. Please do not use leaf blowers. Please do not allow dogs in garden. 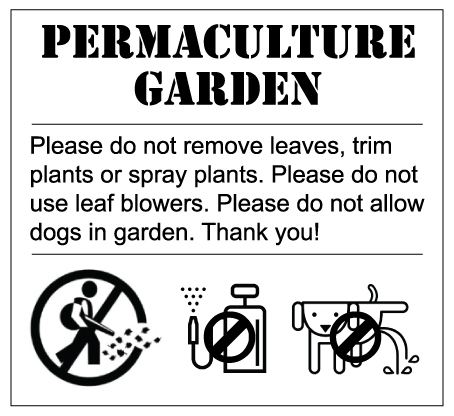 Thank you!” I worked this text out in computer graphics software and for good measure added icons to represent no leaf blowers, no spray and no peeing dogs. I looked online for the graphics and was amused by how many choices of “No leaf blowers” icons there are! I must not be the only person who finds they interfere with my gardening techniques. Computer generated content for signs. These signs will have to be somewhat prominent to be seen, so I tried to make them as attractive as possible and harmonious with my gardening style. First I pried apart the salvaged wood produce crates to get the wood pieces, then I cut them into 8 inch long sections. For each sign I placed two pieces together and held them together in the back with a piece of wide masking tape. This created a roughly square sign (8 x 7.5 inches). I painted a rough square of off-white paint in the middle of each sign, treating the edges very loosely for a rustic look. 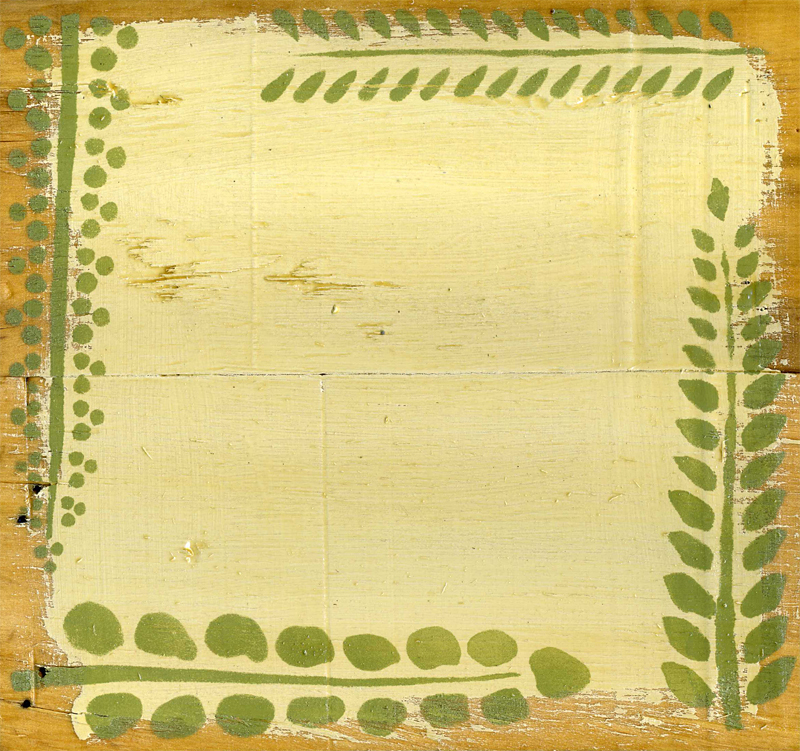 Then I used some medium avocado-green paint to stencil botanical designs around the edges. See my previous article Stencil a Wood Garden Sign for detailed information on how to stencil on wood. Then I painted the backs and fronts with several coats of weatherproof varnish. Sign ground after painting, stenciling and varnishing. Then I took my computer generated text to a copy shop and got six copies printed in reverse on clear tranparencies. The reason for printing in reverse is that I think the ink will hold up better to the weather if it’s on the back of the clear film. Next I punched four holes in the corners of the pieces of film and drilled four corresponding holes in each sign. Then I attached the film to the wood with brads. I purchased six wooden stakes from Schnarr’s, sanded them and varnished those as well. Then I nailed the signs to the stakes and installed them. Here is one of the six finished signs! If all goes well and I actually get the opportunity, I will write about how I chose to deal with the fall leaves and what the results were.